Now, a hot toddy—made from whiskey, lemon, and honey—won’t cure or prevent your cold or flu, but it will ease the symptoms. Sure, a hot tea or chicken soup might have a similar effect, but they don’t have quite the same appeal—especially over the holiday season when you owe yourself a little special down time. 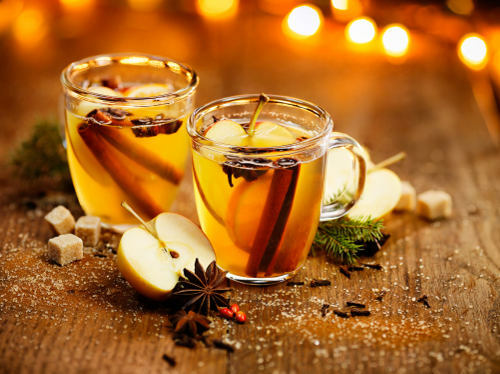 The alcohol in a hot toddy can help dilate your blood vessels, making it easier for your body to deal with infection. The lemon and honey can help loosen up congestion. Remember that alcohol can also lead to dehydration, so you want to make sure you’re getting plenty of water, too, and some hot herbal tea. Having a hot toddy or two, after all, is a bit of special treat, but not the best form of treatment. Getting fluids free of additives is the best way to flush the system and break up mucus. Making a hot toddy doesn’t require a degree in mixology and you surely don’t need to be a seasoned bartender. My grandfather showed me how to do it: all you need to do is pour two ounces of your favorite whiskey into a microwave-safe mug and add a tablespoon of honey. Pour in four ounces of hot tap water and then stir in a teaspoon of lemon juice. Pop the mug in the microwave for about a minute—so it’s piping hot but not boiling—and add a slice of lemon and a cinnamon stick if you desire. Let it sit for a minute and voila!